This is a continuation of my previous post Expect the Unexpected I : The Call, The Painting, The Gift of Love, The Place & The Office. It reminds me of the time before I was admitted to the hospital, when my bestfriend’s beautiful & lovely mother passed away. I’ve known her since I was young. I was the first person she called at around 3 a.m. I didn't believe it. I thought I was dreaming upon hearing the news. Then, I cried together with her. Non-stop. I immediately went to the hospital to be with her. I saw her mother’s body at the hospital. I cried together with my friends. I went to work crying. I felt for my best friend. Her pain, her loss. Her mother was still young, led a very healthy lifestyle. She was vibrant, bubbly and always very funny. Just like all of her daughters. My friends and I all loved her. She was not sick at all at the time. She passed away peacefully in her sleep. Allah loves her more, and Allah plans for the best. We kept reminding ourselves, again and again. But then in the same morning, I found out my dad was also admitted to the hospital. Worry began to overcome me. I cried so much that I had to wear sunglasses in the office. I asked permission to go back early. My heart was not there. Especially so soon when life teaches you that anyone can depart this earth at any time, you realize that whatever time you have with your parents is very precious. Their health, their company. Things can change in a blink of an eye. I had to go see my dad who was at the hospital that day. I cried all the way from the office. I also wanted to be there for my sahabat, my dear Ruzana Ibrahim. I did not know what to say because I felt the loss so much. I just didn’t know what to say because I always feel that no words from another person can comfort a person who has just lost someone dear. So I did not say anything. 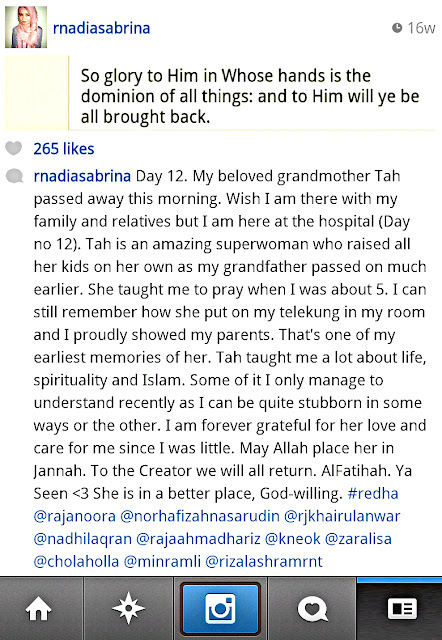 Al-Fatihah. Her children showed amazing strength to support each other, to take turns with each other to be strong when one was weak, and they pulled through. Life gives you challenges: You have to show resilience to overcome them. And they showed me how. Praises to God Almighty. It reminds me of the biggest and happiest “Unexpected” gifts in my life so far, first unexpectedly finding out I was pregnant. The husband and I were both overwhelmed with contentment when we found out. Then another “Unexpected” twist, when I found out that what I thought was pee was actually my water rupturing early at 16 weeks. Finally, it was the “Heartbreaking Moment” when it was confirmed that my water broke early and when I was advised that for me to continue keeping my child in my tummy was highly risky to both our lives. In a blink of an eye, my pregnancy turned from a normal pregnancy into an extremely complicated pregnancy. I had to be on strict bedrest until I delivered my baby (see my previous post PPROM). The doctors said we had a 50-50 chance to survive. Both myself and my baby, my precious Jibrael. It reminds me of my birthday in 2012, a day where I did not receive any presents, but instead I was the one giving out a great gift in a way: having to sacrifice my life, work and everything else to be warded in the hospital for my child’s sake. I gladly did so without any regret and without any hesitation. To give my everything and absolute best. It was the hardest phase in my life so far but I would do it all over again. To feel a mother's unconditional love and to fight together with my baby to hold on tight and stay together as long as we could in this world. That fight. That battle. I would not trade it for the world. Come to think of it, it was the best gift I could ever give to my baby. :) One of the best feelings in this world is when you know you've done your best for someone you love very much, isn't it? Now, I know why they say that the best kind of worldly love is a mother's love to a child. Nothing can top it. It's unbelievable until you've experienced it for yourself. Looking back, I did receive the best birthday gift ever at the hospital. It was the day my life took a 360 degree turn. It was a life-changing point in my life. Lots of precious, beautiful & exclusive moments with Jibrael. My entire focus was on my baby whilst the doctors and my closed ones were worried about me. I did not worry about myself because for me, the world suddenly revolved around my baby. My focus was to stay calm & fight my internal battles to always stay strong and positive for my baby despite the seriousness of my situation during the stay in the hospital. I tried my very best to ignore all sorts of negativity and weakness, to the extent that some of the doctors were worried because there were moments when they said I was being too optimistic! I found it weird. But well, that was what they said. I was willing to do whatever it takes including risking my life for my baby. During my stay at the hospital, there was nothing more important than to keep my child in me as long as possible. We bonded so much as I was on strict bedrest. I couldn't leave my bed except to go to the washroom for 78 days. My baby was with me through all the good and hard times in the hospital. I talked to my baby all the time. Through everything. I couldn't have gone through all those hard times if I wasn't inspired by my baby, my husband and our family. All inspirations comes from Him. All of that would have been unimaginable to me if I didn't experience it for myself. I feel so loved by God as I wasn't 'sad'. God's love and mercy can only be experienced, but not explained. I was extremely happy. Like never before. Contentment beyond words can explain. To have Jibrael inside me. To feel her. 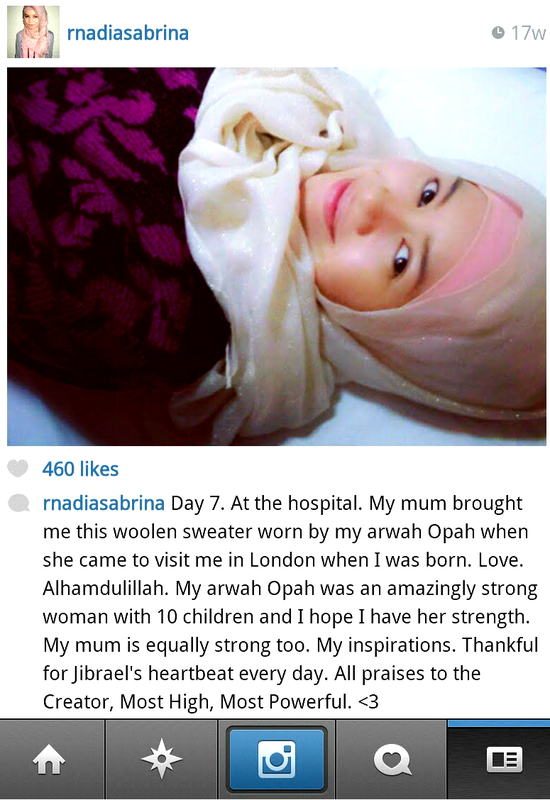 To be inspired by her strength. To have the chance to fight for her. To love her. To have a bond that no one will ever understand. The bond that kept me sane and strong in the hospital. All this together with Jibrael's father of course. Our baby and the stay at the hospital strengthened our marriage beyond imagination. So blessed. Praises to God. All strength comes from Him. Apart from that, I received prayers and well-wishes from people around me and well-meaning and generous souls. Precious gifts. It was overwhelming. To witness so much love in this world. Only God can repay your kindness and I pray that God will reward each one of you excessively. It turned out that my birthday last year, was my best birthday in my life so far. So many blessings. Some hidden, some shown. I could not thank the Creator enough for all the blessings that I've received. I feel so undeserving. All I can say is Alhamdulillah. It reminds me of the time when I found out my beloved grandmother Tah passed away on 12.11.12 barely two weeks from my admission. Not from my mum who was there with me, or my husband who I called several times asking if there was anything wrong. They both denied it, but I knew something was wrong just by looking at my mum’s face that whole morning, and from the way she kept taking her phone calls outside the ward. She assured me everything was fine, as she frantically tried to help in the preparations and to make sure someone could accompany me at the hospital so that she could attend the funeral. I found out through social media updates by my relatives later in the afternoon. My mum went out of her way to protect me from knowing as she knew I was alone at the hospital. She deleted my relatives’ bbm status updates on my blackberry and changed topics when I kept on questioning her. She had to attend to preparations for the funeral so she knew I did not have any emotional support to handle the news. She also knew that I took the passing of my other grandmother Opah very badly, a few years ago. I am very attached to both of my grandmothers so she was worried that I would not be able to take the news, especially since I was in a condition where any stress might jeopardize both my life and Jibrael’s at the time. I can only give praises to God who must have given me the strength to remain strong when I found out the news by myself as I did not cry. My heart teared a waterfall but I didn't let tears run down down my cheeks. It was the first time that I did not cry when a loved one passed on. I remember how Tah was the one who taught me to pray when I was young. I remember all her sacrifices and how strong she was to actually raise her four kids, my dad and my aunts all by herself. I teared so much inside. But I found the strength in me not to cry. To draw inspiration instead by her strength. Because I could not afford to cry. I must not let myself to be stressed out when I was at the critical section of the ward at that time. For Jibrael. For my family who had to face multiple ordeals at once. I did what I could to alleviate their worries, their burdens. I did not want to risk stressing out as it could adversely affect Jibrael. I tried my very best. Praises to God for helping me through it. He sent both of them through my dreams during my stay at the hospital. Happy tears. Beautiful gifts. Indah. Alhamdulillah. It also reminds me of the time when I was at the hospital and exactly a month after my grandmother and his mother passed away, my beloved father got hit by a motorcycle which came illegally from the opposite direction while he was crossing a one-way road. I only had Jibrael with me at the hospital when I found out. No one else. Again, I found out through social media. Everyone who knew tried to hide it from me as everyone rightly attended to my dad and other emergencies. No one picked up my call for about an hour after I found out through twitter. And I found out a few hours after the accident. They did not want me to worry due to my condition. Moreover, it came as a shock to everyone, especially my family and relatives. It was heartbreaking. To say that I was shocked beyond belief is an understatement. I panicked like never before eventhough I was only lying down on my hospital bed. I did not have the strength to contain my tears at that time. I know I should never cry in a situation when I was on strict bedrest to fight for my child's life, but at that moment when I found out, I just couldn't contain my tears any longer. It was just too much to take at that time. To know that my dad met with an accident and was admitted into another hospital. I didn’t know what happened at the time but I knew his injuries were serious. I wanted to go out of the the hospital badly. But, of course it was not possible. The doctors said it would risk my life & my baby's life even further. I had to stay put at the hospital. But my soul wished so hard that I can go and visit my dad. I could not sleep that night. Worried sick. Tried my very best to stop worrying but couldn't. I found out later that my mother could not sleep the whole night as well. Of course. Having her husband and her only daughter in two different hospitals, at the same time. To see my dad lying on the road unconscious after being hit? It is traumatic to say the least. My beloved mother is the strongest mother in the world in my eyes. I really don't know how she does it. I apologised to Jibrael my baby for not being strong enough the moment I found out about the accident. I apologised for crying that night as I know it wasn't good for Jibrael. I continued to pray to the Almighty for the best. 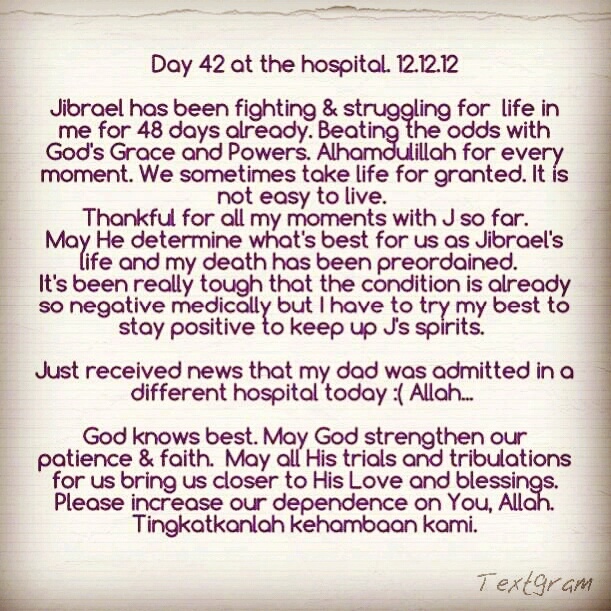 I talked to Jibrael non-stop to regain my strength. I told my baby to pray too. So, we continuously prayed for my dad, Jibrael's grandfather, together. It is a beautiful thing to know that actually I was never alone at the hospital. My baby was with me. God is always with us. Since the accident, my dad was bed-ridden too and was not allowed to go out at all. Just like me. I didn’t meet my dad until a month later, on 14th January 2013, the day I gave birth to my precious little angel, Jibrael. Although he still wasn’t supposed to go out, he came to the hospital. To see me. To see his grandaughter who was so strong and battled every inch of the way for dear life. He managed to see his first grand-daughter before she was laid to rest 12 hours after she was born. ( see Jibrael : The Journey Continues). 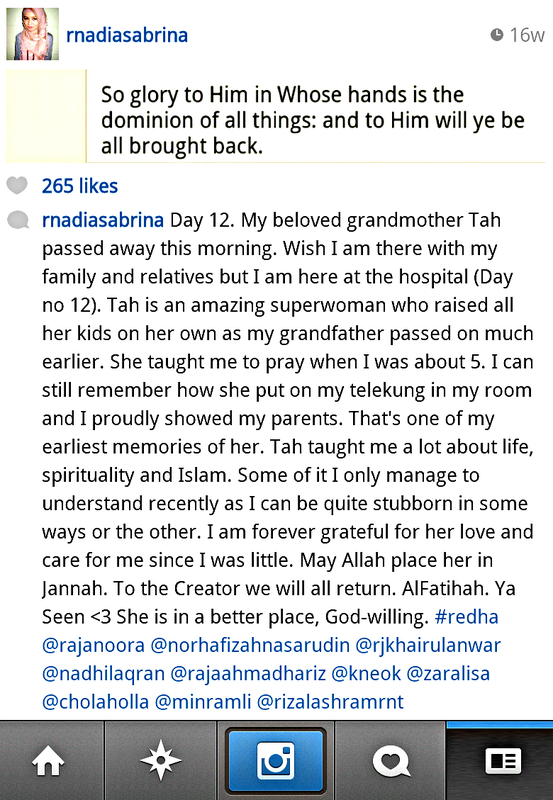 Al-Fatihah. Alhamdulillah, my dad is now getting much better. Slowly but surely, InsyaAllah. Am so proud of his determination to get better. It's really inspiring. You are a strong woman. Your baby is lucky to have you as her mother. Your stories move me so much i can't help but felt so sad of your ordeal. 2012 was a hard year for you. I pray this year will be a good year.